Oh, Bo! 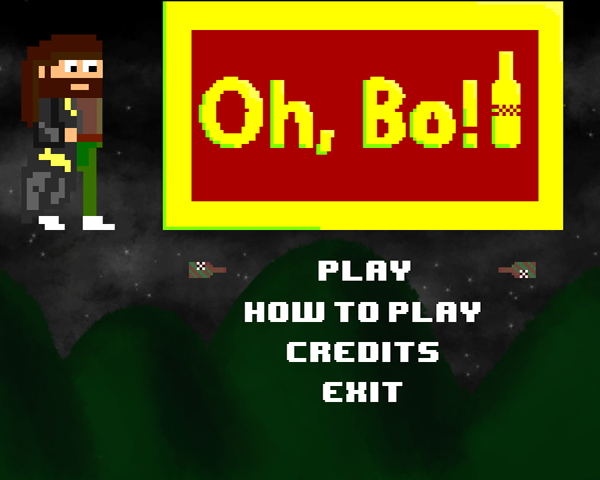 is a side-scrolling platformer where you play as Bo the hobo, a down-on-his-luck oboe player. * Collect money for Bo to buy beer at the end of the day. * When Bo drinks a lot of beer, he gets a large multiplier in the next level. * But be careful, Bo will be harder to control when he is drunk. * After drinking beer, Bo will have empty bottles to throw at enemies. * The money you collect in night levels will be saved in Bo's bank account. * The goal of the game is to make it past the 6 levels and the final boss(enraged bartender), and finally get Bo into rehab. Oh, Bo! was developed by a team from UCI's Video Game Development Club for the Fall 2012 GameJam. It won 2nd place in the week long competition to design and build a game from scratch. This is the second version of the game that has been refined quite a bit from the first implementation. To promote Oh, Bo! and grow its popularity (top games), use the embed code provided on your homepage, blog, forums and elsewhere you desire. Or try our widget. Hit the button! It is a standalone game where the user has to pass the level.